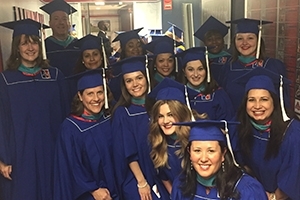 SPA Congratulates the First Graduates of its Online Masters in Public Administration and Policy Program | News | School of Public Affairs | American University in Washington, D.C.
On December 21, American University’s School of Public Affairs graduated the first class from its online Masters in Public Administration and Policy program. At a time when public administration and policy career prospects are strong, the online MPAP prepares students to lead in positions across the private, government, and nonprofit sectors. These jobs require strong analytics, creativity, communication, leadership and problem-solving capabilities. In just 24 months, the part-time online curriculum provides students with analytical, contextual, ethical, and substantive skills and knowledge to effectively advise public policy and lead public programs in government, the non-profit and the private section in the United States and abroad.